I’m so excited to start bringing you sales and coupon codes from one of my favorite websites, Cents of Style! They have great products and always fabulous sales. This will really help with gifts for the holidays. From scarves and hats to shoes and jewelry. Speaking of jewelry…every Friday they have what’s called Fashion Friday where they post a deal. 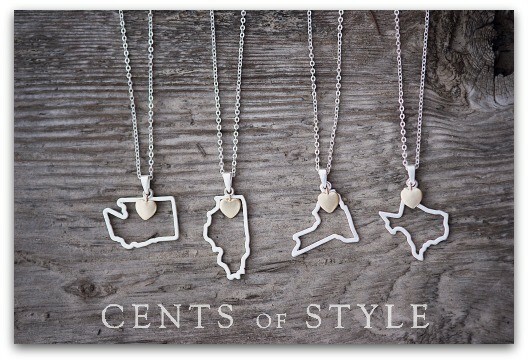 This Friday’s deal are these lovely Custom State Necklaces for only $11.95 with Free Shipping when you use the coupon code HOME! This is 50% off the retail price. The sale ends December 8th. Description: The Custom state necklaces are made of metal alloy brushed in silver, has an 18″ brushed silver chain necklace and features a 3″ chain extender. Order today and it will arrive in time for Christmas! What a great gift! Use HOME as the coupon code at checkout and don’t forget,the sale ends December 8th. Order HERE.